The 35th Infantry Regiment Association salutes our fallen brother, SP4 Dennis Wayne Jacobs, who died in the service of his country on February 27th, 1968 in Quang Nam Province, Vietnam. The cause of death was listed as Booby Trap. At the time of his death Dennis was 22 years of age. He was from San Diego, California. Dennis is honored on the Vietnam Veterans Memorial at Panel 41E, Line 50. The decorations earned by SP4 Dennis Wayne Jacobs include: the Combat Medical Badge, the Bronze Star, the Purple Heart, the National Defense Service Medal, the Vietnam Service Medal, the Vietnam Campaign Medal and the Vietnam Cross of Gallantry with Palm Unit Citation. Dennis is buried in Fort Roscrans National Cemetery, Point Loma, San Diego, California. "Jacobs, Dennis W., b. 07/07/1945, d. 02/27/1968, SP4 USA, Plot: Q 515, bur. 03/13/1968"
Today, May 29, I viewed the information on Dennis Jacobs. There was a note there saying that anyone who knew Dennis should write. He is not forgotten by those who knew him. Dennis and I went to elementary school, jr. high, and were in the boy scouts together. He married a friend, Vicky Hamilton Jacobs who recently passed away and is buried with Dennis at Ft. Rosecrans National Cemetery in San Diego. I stood at his grave on that day. While she was alive, I know that Vicky visited his grave and put flowers on it. Dennis was a good friend and I miss him. I have a picture of him. It's not great because it was taken in Vietnam and was enlarged when it got home. But the young man standing there is definitely Dennis. I can make a copy and email it to you if you want it. Don't know if I have any other pictures, perhaps one from boy scouts and one from a year book in jr. high. Thank you for caring. For meritorious service in connection with military operations against an armed hostile force in the Republic of Vietnam. Specialist Four Jacobs distinguished himself while serving as a Medical Aidman with Headquarters and Headquarters Company, 2nd Battalion, 35th Infantry, 4th Infantry Division during the period December 1967 to February 1968. Despite the hardships and difficult conditions often encountered in his unit's area of operation, Specialist Four Jacobs always conducted himself in a cheerful and highly professional manner. Concerned for the welfare of the men with whom he served, he was always an inspiration to the entire unit and quickly gained the confidence and admiration of both superiors and subordinates. He was quick to grasp the implications of new problems resulting from the ever-changing situations and promptly found practical solutions. His ability to keep calm while under enemy fire, coupled with sound medical decisions, contributed immensely to the overall successes of the unit's missions. Through his mature judgment and professional expertise in caring for the wounded, he insured that a sufficient quantity of medical supplies were readily available. 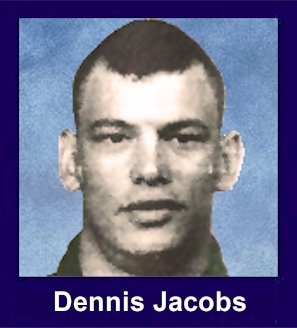 On 27 February 1968, Specialist Four Jacobs was attached to Company C of the Battalion conducting a search and destroy operation when he was mortally wounded by a well-concealed booby trap. Specialist Four Jacobs' performance of duty, concern for the welfare of his comrades, and devotion to his mission are in keeping with the highest traditions of the military service and reflect great credit upon himself, his unit, and the United States Army.